Baltimore Wreath [G1611] - $6.00 : Yarn Tree, Your wholesale source for cross stitch supplies. 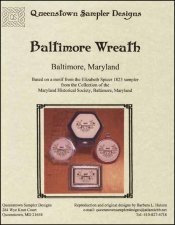 Collection of the Maryland Historical Society, Baltimore, MD. Design sixe is 2.62"w x 1.87"h.